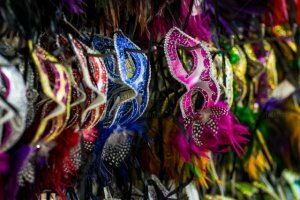 The Mardi Gras season is upon us! The music, dancing, parades, beads and parties are fun, but nothing says Mardi Gras quite like the king cake! Bakeries all across Louisiana are in full scale king cake production. Hundreds of thousands of king cakes will be made and consumed in span of a few weeks. Each bakery has their own unique recipe and they all think theirs is better than the rest. The best way for you to find out who makes your favorite king cake is to head to New Orleans and try them all! 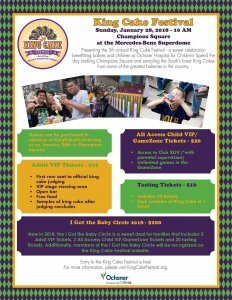 The 5th annual King Cake Festival will be held on January 28, 2018 in New Orleans at Champion Square. Over twenty local bakeries will be set up and serving samples. The festival is free entry to the public and the samples will be sold for 1 ticket. Tickets can be purchased for $1. There will be live music and a Fun Run. Parking is available at the Superdome in Garage 1 and Champions Garage. Proceeds of the festival benefit the babies and children at Oschner Hospital. All the samples will be delicious! But be on the lookout for Nonna Randazzo’s Bakery & The Cocoa Bean Bakery and Cafe. The had 5 winning entries between them.